"Postcard - Mimosa Inn - Tryon, NC - Circa 1920. 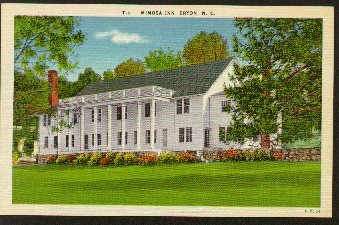 (763) POSTCARD: A Mimosa Inn - Tryon, NC-Condition: Very Good.- Tinted Illustration, Circa 1920. Not Posted. Published by Asheville PostCard Co. Built in 1903, the Mimosa Inn has been a landmark and social gathering place in this area for more than a century. In 1903 the Mimosa Hotel expanded by adding a separate 10,000 square foot 2 story "casino" building which included two bowling alleys, club rooms with billiard and pool tables and a ballroom with a vaulted ceiling which took up the entire second floor. In 1916 the main hotel building burned to the ground, leaving only the 4 chimneys standing. In an effort to carry on the tradition the "casino" was remodeled into what is now the Mimosa Inn.Price: $4.00 + shipping.